The Douglas SBD Dauntless was easily the most famous US Navy bomber of World War II, and possibly the most important dive bomber flown by any combatant during World War II. At the outbreak of World War II, the Slow But Deadly Dauntless was considered by many to be obsolete. The Dauntless was the only US aircraft to participate in all five Naval engagements that were fought exclusively between aircraft carriers, and despite having been marked for retirement even before the war began, the Dauntless sunk more enemy shipping during 1942 than all other aircraft combined. In 1932 aviation genius John Northrop left Douglas Aircraft to form his own company at El Segundo, California. During the next few years Northrop turned out some remarkable designs. The Navy Bureau of Aeronautics (BuAer) put out a request for new purpose-built dive bomber to replace the numerous types then serving in the fleet dive bomber role. BuAer chose the Northrop design over entries from Brewster, Martin and Vought (because they were biplanes, the Curtiss and Great Lakes designs had been rejected out of hand), ordering a single prototype from Northrop under the designation XBT-1 (BuNo 9745). 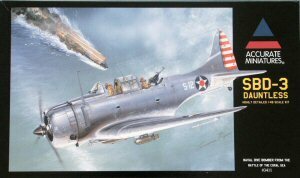 The SBD-3 Dauntless reached the front line units during the spring of 1942, it was originally ordered by the French who had witnessed the destructive power of the dive bomber during the German invasion of Poland. In the event, all 174 machines ordered for the Aeronavale, plus an additional 410 SBD-3 were delivered to the US Navy. The SBD-3 finally brought the Dauntless up to combat standards. 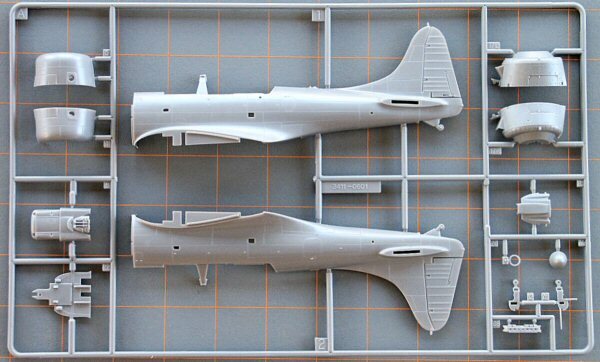 Self-sealing fuel tanks, crew armor, and an armored windscreen were introduced on the SBD-3. The cowl mounted forward firing machine gun that was usually deleted from the SBD-2 was officially reinstated on the SBD-3. A new model of the Wright Cyclone, the R-1820-52, replaced the similarly powered R-1820-32 engine used on previous models. 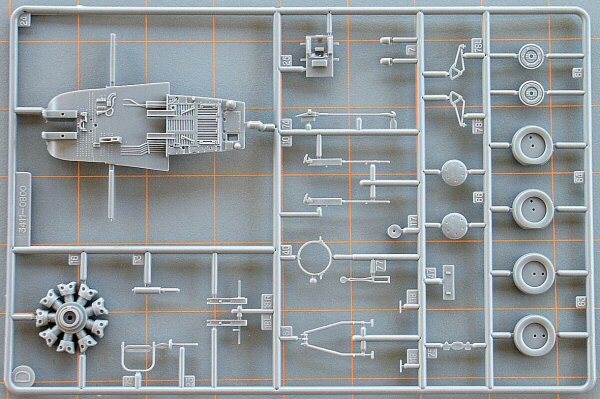 Accurate Miniatures has done it again with the release of this amazing kit. 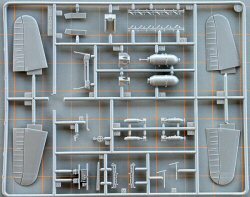 This kit continues in the high quality attention to detail scale model kit we modelers look for. 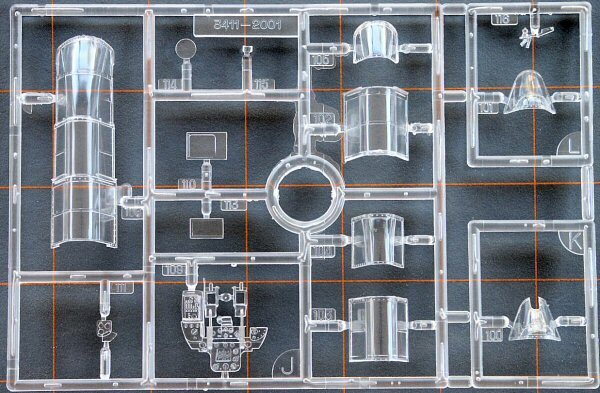 On opening the box, the first thing that jumps out is the individual parts trees wrapped separately in clear plastic. 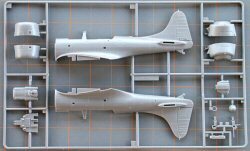 The decals and clear part tree are even more protected with the false bottom suitable for framing SBD-3 Dauntless color profile. 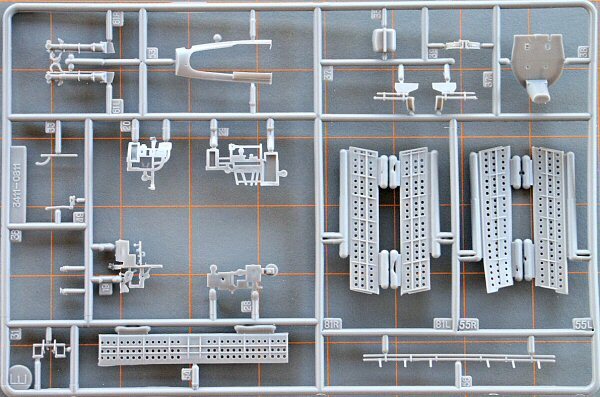 The kit is molded in light gray plastic; some of the parts have come off their trees during shipment. 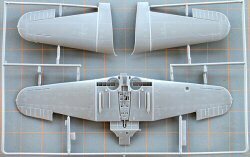 My review sample revealed very little flash, the dive brakes were warped, probably at result of being removed from the molds to soon, the wings were also slightly warped. Very few noticeable injector marks and sinkholes are present. 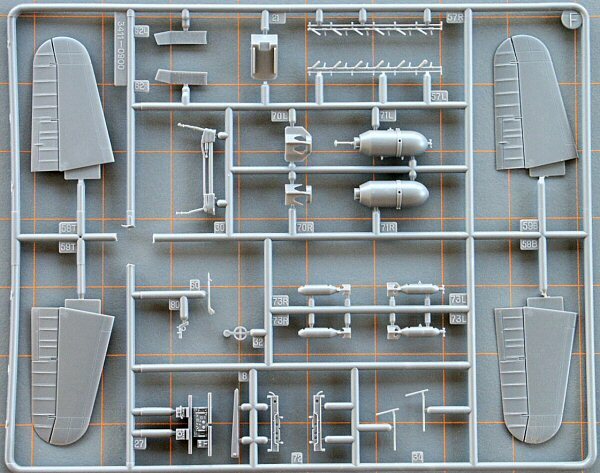 No sprue B was included with the kit, as this is probably reserved for another variant of SBD Dauntless. The kit instructions are very well laid out and contain 10 easy to follow pages with painting instructions throughout and a paint cross-reference chart for Federal Standard colors associated with the kit. 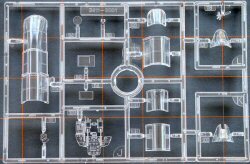 The decal sheet is very clean and in perfect register from Microscale. 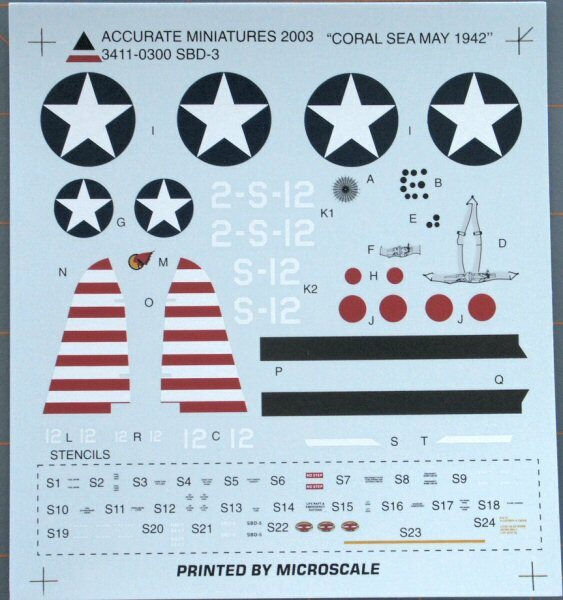 Only one decal option is included with a full array of stencils. 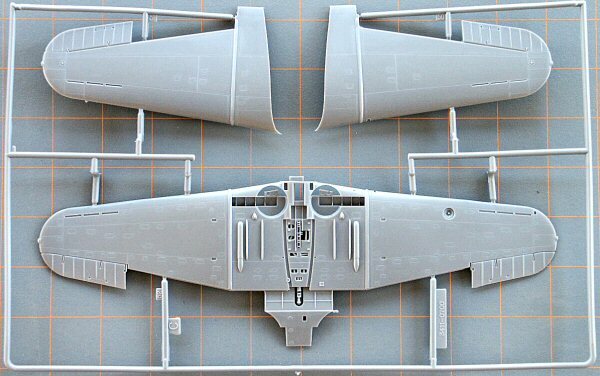 The decal option will be reviewed during the kit build-up review. 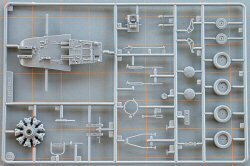 As with every other release from Accurate Miniatures, this kit is a beauty straight from the box and if you have one of the correct kits, this is a straightforward build. 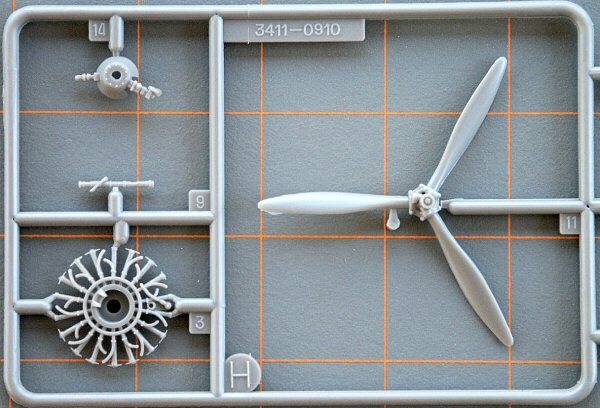 With all of the detail in this kit, less experienced modelers shouldstudy the instructions and take their time assembling the model.The results are worth it.